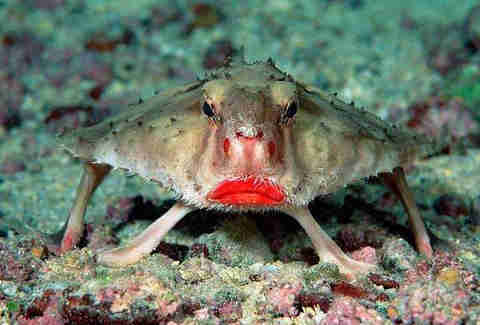 Not many sea creatures can boast the perfect pout of a Hollywood starlet, but the red-lipped batfish comes pretty close. Catch a glimpse of the cherry-red lips on this little fish and you’d swear he’d eaten a tube of lipstick or a messy Popsicle — but his rosy mouth is 100 percent natural. The batfish is a favorite among divers exploring the waters around the Galapagos Islands and off the coast of Peru. 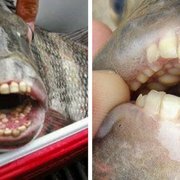 It’s unclear why the fish evolved to have such a seductive pout, though some scientists believe that the large, practically fluorescent lips, framed by a blond beard, help the fish attract mates. And is there any doubt? 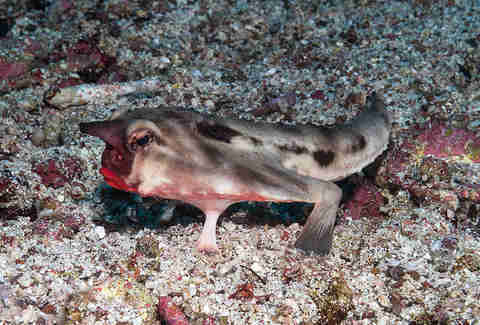 But the red-lipped batfish’s striking mouth isn’t the only attribute that makes the evolution of this fish unique. The species is pretty special, even by the Galapagos’ standards — the islands have the highest number of plant and animal species not found anywhere else on Earth, and famously inspired Darwin’s theory of evolution. An awkward swimmer, the batfish prefers to use his strong pectoral and pelvic fins like legs to “walk” across the ocean’s sandy bottom. Luckily, speed and grace aren’t necessary for this fish to get a meal. While his lips are an enviable red, the rest of the batfish’s flat body is a brownish-gray color — perfect for blending in with the rubble on the ocean floor. When the red-lipped batfish is hungry, all he has to do is find a good spot and secrete a bit of fluid to attract prey. Yep, the batfish isn’t afraid to spritz a little perfume to make himself even more alluring. A member of the anglerfish family, who are known for “fishing” for their prey, the batfish’s horn-like nose acts as a fishing pole. A fleshy piece on the end of a spine hidden under the batfish's nose can be dangled down to act as “bait,” enticing smaller fish and crustaceans to come closer. The combination of the batfish’s droopy mouth and long upturned nose can give the impression that the little fish is unimpressed with his surroundings, but turns out he’s not snooty or bored — he’s just waiting for his next meal. 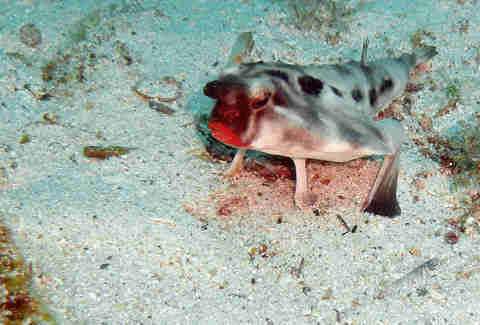 A mature batfish grows to be about 25 centimeters (10 inches), but he's fortunately not of much interest to fishermen. One of over 450 unique species of fish who swim in the Galapagos waters, hopefully he'll be strutting along the ocean floors for many years to come.